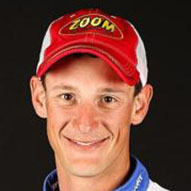 Brandon Cobb achieved his first tour-level victory on his home lake. The ability to make the right adjustments is about the most important trait a professional angler can possess. 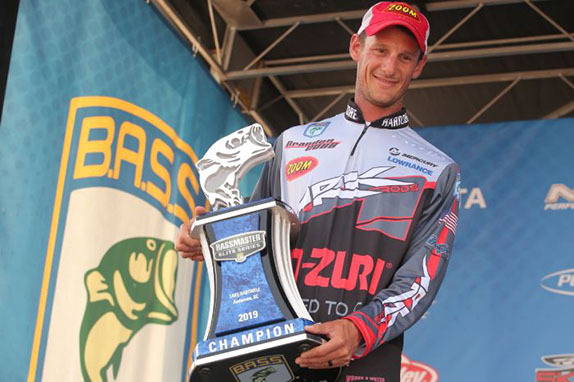 Brandon Cobb displayed that characteristic en route to his first tour-level win at the Lake Hartwell Bassmaster Elite Series. Competing on his home water, the resident of Greenwood, S.C. transitioned from docks to bed-fishing in the midst of his wire-to-wire victory. There was barely a 3 1/2-pound weight differential between his four bags and he ended up approximately that same amount clear of his nearest challenger. He entered the final round with a 5 1/2-pound lead and spent the morning fishing around spawning blueback herring. That foray proved fruitless and he doesn't know why, but it didn't matter in the end as he still had plenty of time to return to the shallows and pluck what he needed off the nests. His 16-14 haul on day 4 gave him a 72-04 total and earned him his first six-figure payday. 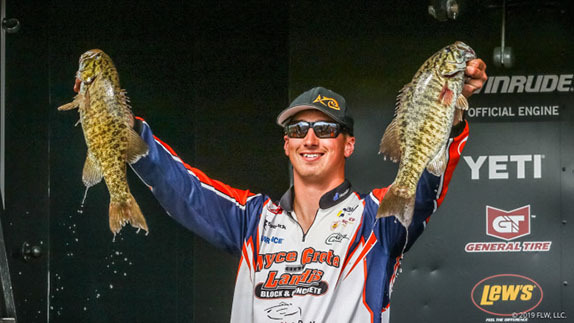 It also moved him up to 2nd place in the Angler of the Year race, just a single point out of the top slot with the season set to reach its midway point following this week's tournament at Winyah Bay. Following are some of the particulars of the 29-year-old Cobb's approach at Hartwell. 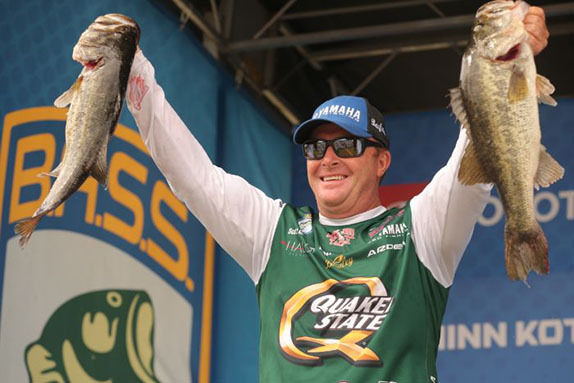 Cobb described his three days of practice leading up to the event as "pretty terrible," but there's a caveat to that � he avoided most of the areas where he knew he'd fish in the tournament. He waypointed some spawning beds and went into the first day of competition with the mindset that boat docks would be his primary focus. As they do at many venues, a lot of Hartwell's bass hang around docks after participating in the reproduction process, feeding up before making the journey back to their deep-water haunts. The three biggest fish in his 19-09 bag on day 1 came from docks and he thinks another that went to the scale did so as well. His bait for that program was a Zoom Fluke Stick fished wacky-style on spinning gear. "I was skipping it and moving really quickly," he said. "I'd barely have time to engage the reel when one hit it and one fish on the third day ate it off the top of the water while it was skipping. "I'd make one skip under the pontoon and one under the front and then keep going." It was on day 2, which featured rainy conditions, that he really started working the bed-fishing program. The lack of sun wasn't a major hindrance in the clear water. 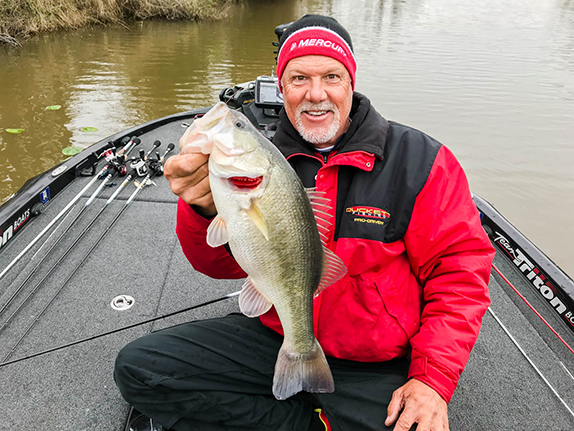 "When it rains a little bit at Hartwell and then just stays cloudy, it moves some of the pollen around and actually makes (seeing fish) easier. You weren't going to see them from as far away, but it wasn't really hard." When he'd identify a bed but was still too far away to see the fish, he'd make pre-casts with the Fluke Stick with the hope of hooking up quickly. About half of the spawners he caught were enticed in this manner. "It was much easier if you could do it that way. Sometimes I'd troll across one that didn't bite and I'd Power-Pole down and watch it for a little while. If I didn't think it would bite within a few minutes, I'd come back later and do the blind-cast thing. "The biggest problem with sight-fishing is it was so hard to tell the size of the fish � a lot of them were so close to the same size (between 2 and 3 pounds). His sight-fishing setup included a Zoom Trick Worm attached to a shaky-head jig. He spent most of his time in the Seneca River arm, but also fished some in the mid-lake region. "I kept moving all the time and didn't fish anywhere for too long," he said, noting that he never spent more than about 10 minutes working on any bed-fish. "One thing that also helped was that, knowing the lake like I do, I never ran out of places to fish. Even if I hadn't practiced there or hadn't even been there in five years, I always knew that I had somewhere to go where I'd caught them before." > Stickbait gear: 6'10" medium-action Ark Invoker Series rod, Abu Garcia Revo X size 30 spinning reel, 10-pound Yo-Zuri Super Braid (main line), 10-pound Yo-Zuri HD fluorocarbon (6' leader), 1/0 wacky-rig hook, Zoom Fluke Stick (several variations of green-pumpkin). > Sight-fishing gear: Same rod, reel and line, 1/8-ounce Greenfish Tackle Clean Up Shakey Head jig, Zoom Trick Worm (green-pumpkin). > Cobb gets to fish his second straight event in his home state the week, but Winyah Bay is a much less prolific bass fishery than Hartwell. "I was pleasantly surprised when I went there and pre-fished (earlier this year), but it was at a time when it had been really cold and then there was one week of 70-degree weather. They were probably biting as good as they can possibly bite."